I’ve been looking for more applications for the ip geolocation. 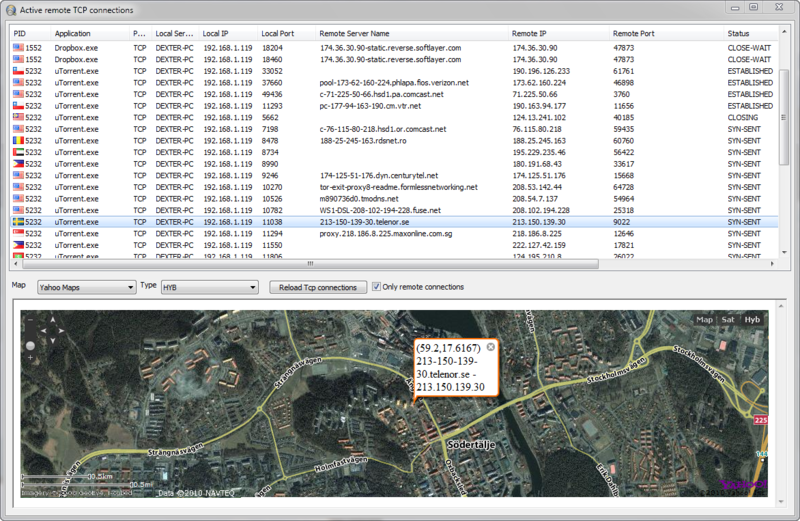 so I wrote this small tool wich show the open remote tcp connections location on a Web Map (Google Maps, Bing Maps, Yahoo Maps and OpenStreetMap). This application is only for educational purposes. because some maps services does not allow to display content from a desktop application. First we need obtain the current tcp connections, to do this we can use the GetExtendedTcpTable function wich is part of the iphlpapi.dll. The code of the thread for resolve the ip locations and retrieve the flags images. Now the class to obtain the geolocation info and the flag of the country. Categories: Delphi, Geolocation, Networking | Tags: Delphi, Geolocation, Networking | Permalink. 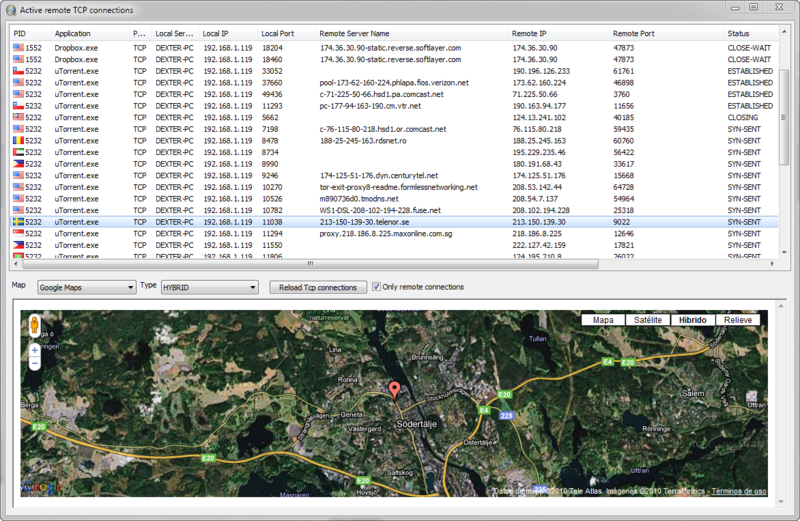 Using the free service of ip geolocation provided by http://ipinfodb.com/ , you can do very cool things. 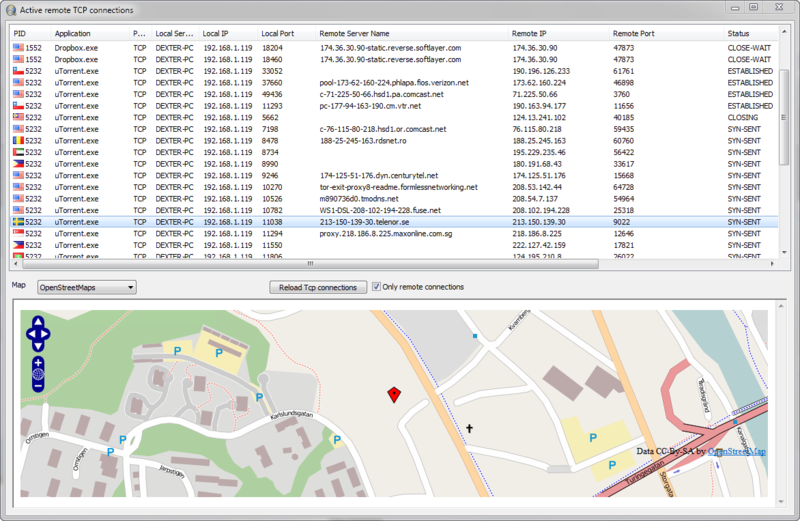 See this sample wich intregrates a trace route and the ip geolocation, to obtain the location of every server included in the trace of an ip address. Now the function to retrieve the geolocation, the url was updated to use the new api published the 2010-11-15. Now using the IcmpCreateFile,IcmpCloseHandle and IcmpSendEcho functions we can write a trace route function. and now the implementation of the TGeoTraceThread TThread, the code was commented to explain the logic of the trace route. 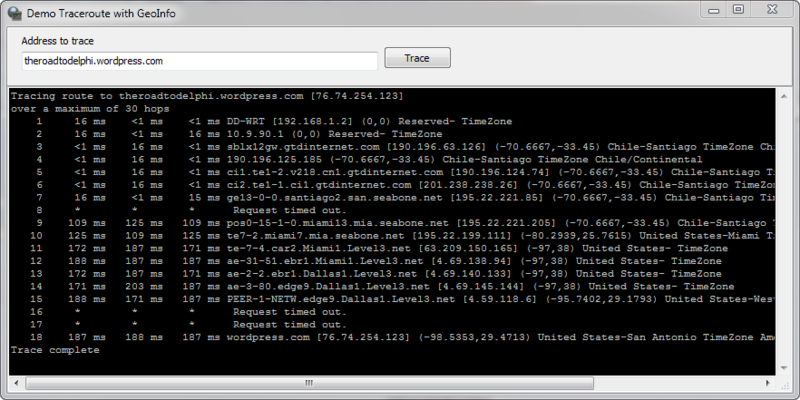 and the output look like this, check which the trace includes the latitude, longitude, timezone, country and city for each host included in the trace. 8     *        *        *      Request timed out. 16     *        *        *      Request timed out. 17     *        *        *      Request timed out. Categories: Applications, Delphi, Delphi 2010, Delphi XE, Geolocation, Networking | Tags: Applications, Delphi, Delphi 2010, Delphi XE, Geolocation, Networking | Permalink. 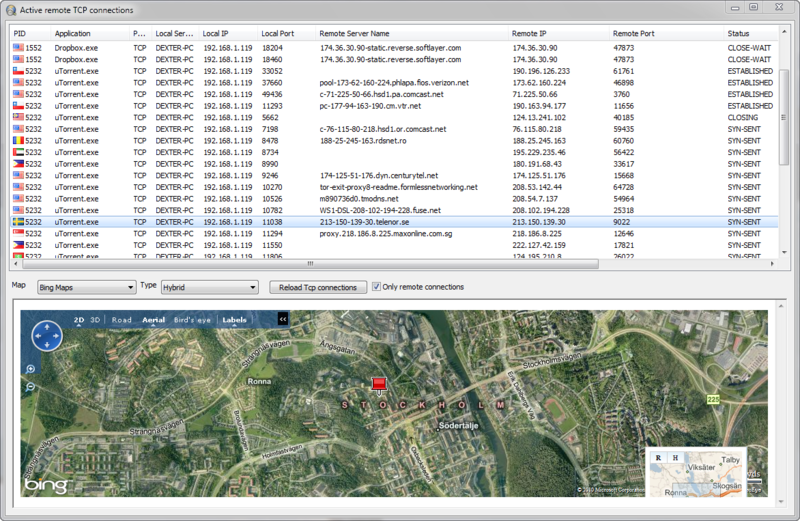 ipinfodb.com provides a free service wich let you obtain geolocation info about any ip address. you can access this info parsing the content returned by this page. The above url is not longer valid because to a New APIs are being introduced with API key. you must register in this site to get access to the info. Now using a TIdHTTP component you can get the result of the request to this page. lHTTP.Get(Format(UrlGeoLookupInfo2,[IpAddress]), lStream); //if something is wrong try using the backup server.